The clean elegance of straight lines and geometric shapes lends a calming beauty to this modern landscape. Japanese boxwood and bamboo each have a strong, eye-catching form in the landscape. Choose materials in neutral colors, like pea gravel, limestone and concrete. Select one plant and one color to take center stage. Editing is key in a successful modern design. Use this design sheet to help you create the perfect modern landscape. You'll get ideas for color, décor, materials, plants and fabric. It is a great starting point for any landscaping project. Contemporary landscapes are known for having a clean, minimalist look with no clutter. In contrast to the naturalistic, wavy borders popular in many landscapes, this style emphasizes straight lines and geometric forms which better reflect and relate to the architecture. David Wilson, the award-winning designer behind David Wilson Garden Design, says “One of the key ways I know my design is successful is when every element in the landscape is essential. If nothing can be removed without leaving a void, you’re left with the simple beauty of a modern design.” Here, Wilson shares his tips for designing in this style. Do choose pale colors for your modern landscape. “There’s something honest and simple about a lack of strong color, ” says Wilson. By using neutral, naturally-colored materials like ipe wood, limestone, weathered steel, concrete and pea gravel, you allow the sleek lines of the architecture and the landscaping to shine. Do choose plants with a distinct form. Japanese boxwood is a favorite because it can be clipped and manipulated into shapes, but spiky plants, soft-textured weeping plants, and anything with a strong visual punch can create the right effect when used skillfully. Do utilize straight lines and shapes such as rectangles and circles in your design. “I’ve always appreciated the effect of a long clean line or a beautifully-measured radius, ” says Wilson. 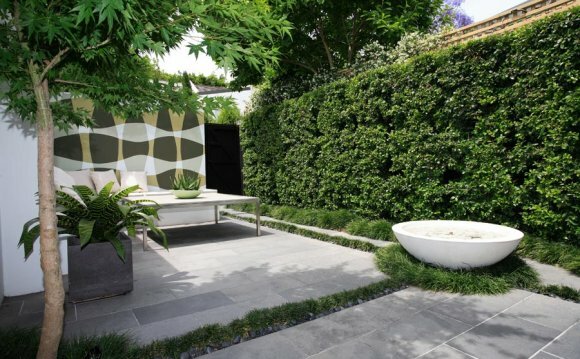 You can break up long lines of shrubbery by adding a parterre or geometrically-shaped bed at the end of them.